Crust: I used a bought graham cracker crust, as I did not have the time to do this from scratch. I painted the bought crust with some beaten egg white and baked it for 5 minutes and let it cool down completely. Spoon into shell and bake at 350F for ± 30 minutes till golden brown. Let cool completely and then continue with the glaze. Melt 113g (1 stick) butter and 170 g (6 ounces) chocolate chips in microwave. Do not cook!!!! Mix and spoon smoothly over cheesecake mixture. Leave overnight in the fridge in order for it to set properly. 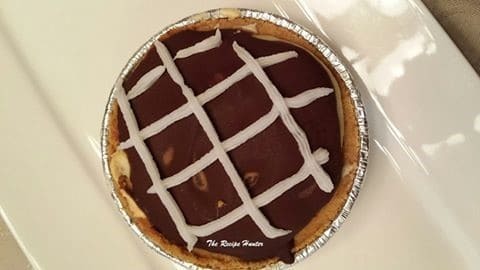 I ran out of chocolate chips to melt and drizzle over the glaze, so I made use of some white Whilton decorating icing, but decorate OR not as you like.